Industrial Engineering: A Failsafe Degree? Individuals seeking a new career path in the engineering field may contemplate earning a degree in industrial engineering, believing this industry offers failsafe job options. Are the job prospects as positive as most individuals believe them to be, especially in the present struggling workforce? Industrial engineers focus on the design, development, implementation, and improvement on integrated systems, taking into consideration people, information, materials, energy, and equipment. From the factory assembly lines to hospital operating rooms, industrial engineers help improve complex processes to eliminate wastefulness in a wide range of industries and production processes. Industrial engineering offers individuals a wide range of career possibilities. The greater your experience and qualifications are, the more job opportunities are available to you; however, with the multitude of choices and much-needed commitment required in this field comes tough decisions that could impact your prospects. In order to increase your chances of finding a position as an industrial engineer, you need to focus on opportunities that are best suited to your strengths and skills, allowing you to be the most effective. Industrial engineering is predicted to increase by approximately six percent between the years 2010 and 2020, which is less than the overall occupational average; however, being versatile in both the pertinent industries and work nature, industrial engineers are attractive to most employers because their work can help businesses increase efficiency through cost control. Besides playing a crucial role in providing a corporation with a competitive edge, industrial engineering offers individuals many positive prospects in this career. Industrial engineering offers a wide range of career choices. Because industrial engineers do not specialize in a specific field, as do other engineers, they can seek employment in various industries such as hospitals, major manufacturing industries, research and development corporations, and consulting and engineering services. Industrial engineers focus on reducing a companys internal costs, which makes them a valuable asset to even the fastest growing industries. For those contemplating industrial engineering as a career choice, individuals need to take into account that finding a job in this industry may be hindered because many employment opportunities in manufacturing industries are projected to decline or only slowly grow through over the next few years. After obtaining the proper amount of experience, it is not uncommon for industrial engineers to be promoted to a managerial position. For those who are seeking a management position, industrial engineering offers an easy solution. Aspiring industrial engineers obtain similar business training and education as business students, and many times industrial engineers will minor in sales or businesses administration. Additional math, technology, and science training make industrial engineers more marketable to employers, and many will complete their educational experience by earning an MBA. Nigel Cunningham is a writer and blogger currently penning articles for Allight Sykes, a company which supplies a range of products such as light towers, mining pumps and other equipment. Most college students will change their major at least once, if not more often. This isn’t bad if it’s the first week of school, but if a student changes his or her career course three years into college, they’re going to suffer setbacks in several forms by having to pay for extra courses to fulfill the requirements of a new degree. The unfortunate truth for many college entrants is that they begin their post-secondary education without any idea of what they want to specialize in. In many cases, these students could have saved themselves time, money and stress by doing research early on in their professional pursuits – even while they were still in high school. When refining one’s interests and targeting specific fields of interest, one of the worst things a high school or college student can do is place their future in the hands of a school guidance counselor. Considering the average of 457 to 1 counselor-to-student ratio is nearly twice the recommended ratio according to the American School Counselor Association, it is unrealistic to expect high performance by counselors under such conditions. Counselors are often tasked with a number of wide-ranging responsibilities not related to career counseling. Counselors are often trained to provide interventions and one-on-one counseling to students, but unfortunately, the constraints just detailed prevent them from providing comprehensive, effective guidance and advocacy for every students college planning. Discussing future prospects with a school counselor can still be beneficial, but if students and parents want to maximize their benefit, they need to be proactive. In addition to resources like the College Readiness Indicator System, which is designed to support school counseling efforts by using data analysis to determine how ready for college a high school student is, parents and students alike need to actively conduct research and explore their options. Going on school visits, meeting with prospective college advisors, and doing other legwork can provide much more “guidance” than a school counselor has the time to offer. That doesn’t mean anyone has to map out the rest of his or her life at age 17. But narrowing down interests ahead of college can help a person focus general education in a way that best serves the most likely career paths. For example, if a student is interested in math and science fields, taking prerequisites and general education courses that work toward a Master of Science degree can make things easier once that specific degree path is determined. Some career paths can be more complicated than others. The engineering field, for example, features a range of degrees and specialties that often appear similar on the surface but can be widely divergent from one another when the details are examined. Many students eventually entering into a construction management degree program settle on this career path after exploring their options in the field of engineering and construction. Because most college students want to prepare themselves for a profession likely to exist throughout the course of their working years, job outlook is a key consideration when narrowing a career search. The Federal Bureau of Labor Statistics is a great resource for learning more about any profession a student might consider. From taxi drivers to government officials, a number of resources provide information spanning several aspects of each job, including the average pay, working conditions, education requirements, additional training, and — most importantly — the job outlook for that profession. Construction management, mentioned above, is projected by the Bureau of Labor Statistics to enjoy an average job growth of 17 percent between 2010 and 2020, a figure slightly above the national average for all jobs. That means students earning a construction management degree may experience average or slightly above-average job opportunities over the next decade. In addition to job research, other methods of personal discovery are available, including job shadowing of construction management personnel to aptitude tests that gauge a student’s interests and skills and suggest fields that may be a good fit for them. Of course, there’s a reason colleges force students to sample courses from a variety of professional paths and interests. It can be hard for students to know what they want to do when they don’t know all the options available to them. The ultimate goal for both students shouldn’t be choosing a career path as early as possible. Instead, early active exploration and research should be the emphasis. With those goals in mind – and a little patience backing those efforts – the career will come in time. The petroleum industry is experiencing robust and sustained growth as the international and domestic demand for petroleum products, ranging from gasoline to lubricating oil, continues to rise. Because of this, petroleum engineers are in great demand; some students have even been able to obtain well-compensated and secure employment before their graduation. Currently, the Bureau of Labor Statistics (BLS ) estimates that there are over 30,000 petroleum engineers employed in the United States. The job opportunities for petroleum engineers are expanding at a robust 17 percent with over 35,000 positions expected by 2020. In addition, job openings due to retirement and other sources of attrition help ensure a wide range of opportunities for individuals seeking to enter this field. The BLS has also determined that petroleum engineers enjoy excellent salary and benefit packages, with the median annual salary for a petroleum engineer exceeding $114,000, while the upper 10 percent of engineers earn over $166,000. In many cases, these wages do not take into account very generous vacation, housing, and medical plan options. 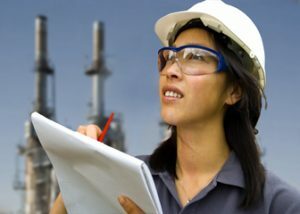 However, because the market for petroleum engineers is such a competitive one, and obtaining a skilled staff so vital to the effective exploitation of petroleum resources, many companies prefer to hire students before their graduation in order to avoid the risk that another business will secure the students services first. In addition, this competitive job market helps ensure that students and graduates alike can obtain very promising compensation and professional packages as a part of their hiring contract. In addition, offering a job to a student who has not yet graduated can allow a company to help the student focus on those areas of expertise that the employer finds most important. Given the wide range of specialties within the field of petroleum engineering, this can allow a company to dramatically reduce the amount of training required for a newly hired engineer. It also allows the student to prepare him or herself for the job by learning about the employers corporate culture and mission. The growing demand for petroleum engineers is largely due to two factors. The first is the continued growth of the national and international energy development sector. The need for petroleum engineers, whether it is to work in traditional oil fields or to work in research and development for more efficient methods of oil extraction, has created an insatiable demand for highly qualified employees. Because of the specialized knowledge and skill base required to work in the petroleum industry, retraining other engineers for this field is unfeasible in most cases. In addition, the highly skilled faculty needed to train students in petroleum engineering has created a bottleneck in the supply of new graduates. From 1957 until the last decade, enrollment in petroleum engineering programs suffered a steady decrease in class sizes. When coupled with retirement and other sources of attrition among currently employed engineers, this educational decline contributed to the current shortage of qualified petroleum engineers. While many schools are attempting to expand their programs, the need to secure experienced instructors and facilities places a limit on how quickly these programs can expand. Although it is likely that the supply of graduates will eventually match the current demand, for the foreseeable future, petroleum engineering students will continue to enjoy excellent job and salary prospects offered by employers who continue to face a shortage of qualified engineers. Furthermore, the continuing expansion of petroleum extraction operations into previously untapped areas, coupled with the growing energy demands of the developing world, make it certain that this career field will continue to experience robust growth. This makes becoming a petroleum engineer an excellent choice for students seeking a secure career in todays business environment. This piece was written by Eric Satterberg, a freelancer who concentrates on education, engineering, mathematics, science, oil and gas, energy, alternative fuel sources and other related issues; to learn more about engineering visit Audubon Engineering.